Study the effect of air pressure with this simple, yet innovative apparatus. 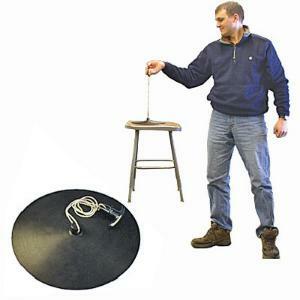 Place the black rubber disk on a table, and try to lift it off with the handle. The disc, which appears to adhere to the table, is almost improssible to lift. Nearly 15 lbs. of air pressure is applied per square inch. Up to 1300 lbs. of pressure is applied to the Vacuum Lifter when all the air is evacuated from under the disk. Though the disk does not lift vertically, when just an edge is lifted, air is allowed under the disk and it will lift very easily. Lifter is designed for use with any flat smooth surface. Size: 26cm.